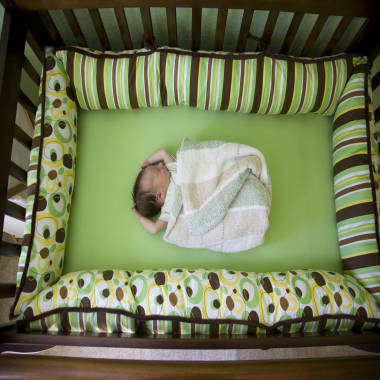 Chicago bans crib bumpers: Will you bump them out of your nursery? Sweet dreams, or a dangerous scene? Chicago says no to bumpers. Could crib bumpers be the next item to get knocked out of the nursery by safety concerns? Many experts say bumpers can suffocate babies if their heads get near the padded crib guards and they can’t move away, or if baby gets wedged between a bumper and the mattress. But as long as retailers offer bumpers - often sold in cute, coordinating nursery sets - some parents will keep on buying them, despite the risks. Not in Chicago, which became the first municipality in the nation to ban the sale of bumpers with a unanimous vote Thursday night. Nancy Cowles applauded the Chicago vote, and believes bumpers should be outlawed everywhere. Bumpers were first offered as a way to keep babies’ arms and legs in the crib before regulations required crib slats to be narrow enough to prevent babies' bodies from falling through, Cowles said. Today, she said, they’re an unnecessary item mainly bought for decoration. The American Academy of Pediatrics says bumpers should be removed from cribs once kids can stand (because toddlers may use them as a boost to climb and fall out of the crib), and adds: "If bumper pads are used in cribs, they should be thin, firm, well secured, and not 'pillow-like.'" The Chicago move comes as the federal Consumer Product Safety Commission conducts a bumper safety review and notes that some infant deaths have been linked to bumpers. As the bumper debate goes on, there’s no doubt that they can add to the design of a nursery. Take a look at Mariah Carey’s beautiful nursery, which got taken to task for its bumpers by a doctor blogging at BabyCenter. What do you think? Do you still use bumpers, or should they go the way of mercury thermometers and drop-side cribs? Share your thoughts in the comments.